Cobblers boss Rob Page says he never had any doubt Rochdale would recover from their shocking start to the season. Dale arrive at Sixfields on Saturday (ko 3pm) sitting pretty in fifth in the Sky Bet League One table, having won 14 of their past 20 games in all competitions. But it was a different story in the middle of September, when Rochdale were bottom of the table, without a win and having claimed just three points from their opening seven league fixtures. They broke their duck with a 2-1 win over Fleetwood at Spotland on September 17, and they haven’t looked back, claiming 10 wins in their next 14 games to fly up the table. It was a change in fortune that didn’t surprise Page. “They had a dreaful start to the season, where they were bottom and a lot of questions were being asked about them,” said he Cobblers boss. “I have played against Keith Hill’s teams many times before, and I knew they were going to come good. “I think they had five or six wins on the bounce which took them from rock bottom to potential play-offs, and now they are there or thereabouts. “They have earned the right to be there because they have been winning games, and they are a threat because they can score goals. Confidence is something the Cobblers players could with a bit more of following a run of five defeats in six matches, with the latest loss being the FA Cup at Stourbridge on Tuesday. Page is keen for everybody to try and put that nightmare evening out of their minds though, and instead wants his players to take heart from last Saturday’s 3-2 win at Port Vale, and also the second-half performance of the previous league game against promotion chasers Bolton Wanderers. 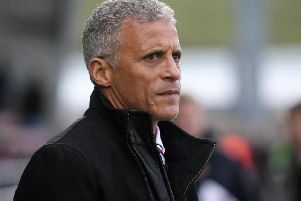 “We have to forget the cup game now, and try and take the confidence from our league form,” said the Cobblers boss. “Albeit we suffered a 1-0 defeat against Bolton, the second half performance was exceptional, and the Port Vale performance was very, very good, and we could have scored six goals in that game. “We have to take that into Saturday’s game, and if we do that then I am confident we will come out as winners. “Of course, everybody associated with the football club is disappointed with Tuesday’s result. “I totally agree with that, but there is nothing we can do about it now, it is done and we have to learn from our mistakes. “We have to focus on Saturday’s game, and if we win it we could potentially go 10th in the table. “With a busy Christmas period coming up, there are points to play for and our main aim is to accumulate as many points as we can, can we get to that 30-point mark?